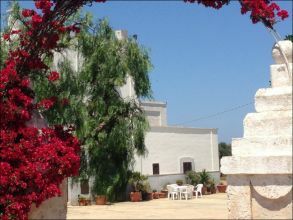 Italy Property for sale in Apulia, Fasano, Masseria with sea view and olive trees. For sale in Fasano agrora, beautiful seaside farm and a short walk to golf courses, marinas and luxury hotels. The farmhouse is made up of a superior mansion to be restored and a lower living area. It also has natural caves, nature wonders, an old crusher with old grindstones, a floor in some chianche areas, a typical and original stone of the area, an artesian well. From the property you have a wonderful view over the surrounding countryside and the sea. The land of about 6.3 hectares is cultivated with centuries-old olive groves and various vegetables. The farm is well suited for both private style and charming hotel charm and elegance.